I have 4 different layouts in all of my booths and I'm using 2 versions of Sparkbooth DSLR. Version 4 in 2 booths and version 5 in the other 2 booths. With the booths using version 5, I've started experiencing a problem. After each session, Sparkbooth is defaulting back to layout number 1. My version 4 booths stay on the layout I have selected until I decide to change it (which is how we prefer it). Any ideas as to what I need to do to stop the Sparkbooth DSLR version 5 booths defaulting back to layout number 1 each time. 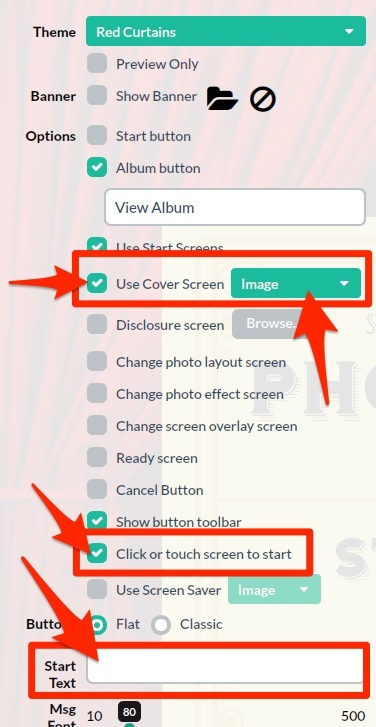 You can change that behavior in the "Reset To" setting under Photo Layouts. Wow thanks for the quick response as always. One more question, out of interest, is it possible to change the appearance, colour etc of the red start button that appears on the start screen. All of my booths are vintage and I’d really like a vintage style start button. the "button" it starts the session.